We are learning about humanity’s many impacts on the near and distant future of our planet. Some people are in denial about these impacts, while others are concerned and ready to do whatever we can to ensure that our Earth will support future generations. To support and encourage such positive action, leading botanist Peter Raven will visit the UCSC Arboretum next week to meet with UCSC faculty and staff, and present a public talk, “Saving Plants, Saving Ourselves.” Raven will present an informed update on the increasing threats to Earth’s environment, and emphasize the special role of public gardens in conserving plants that could be lost through habitat loss and climate change. Peter Raven has a long friendship with the UCSC Arboretum, and a national reputation as a conservationist and advocate of global biodiversity: Time magazine hailed him as a Hero of the Planet. His visit to the Monterey Bay area inspires us to reflect on the home gardener’s unique role in saving the planet. Here are ten everyday practices that gardeners can apply to help sustain the environment and protect plant diversity. Irrigate your garden wisely, using drip technology to deliver water only where needed, and mulch (organic or inorganic) to minimize evaporation and weed growth. Recycle household water into the garden, using plant-friendly soaps and detergents. Prune your acquisitions of consumer goods that bury our landfills and clutter our environment…and that you really don’t need. Propagate plants that Nature’s pollinators (bees and other insects, bats and birds) love and need to survive. Clusters of flowering plants will enrich your landscape. Select plants that are native to California or other summer-dry climates, to enable their healthy growth, support wildlife and ease your gardening workload. Cultivate these good practices among your friends and neighbors. The UCSC Arboretum employs these practices regularly, and assigns high priority to its work in plant conservation. 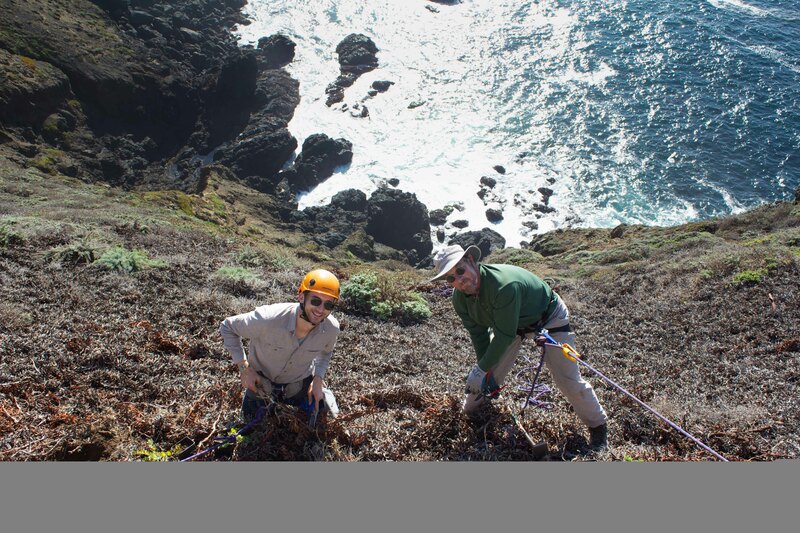 This photo shows UCSC student Austin Robey and Arboretum volunteer Tim Forsell as they replanted endangered California native manzanita shrubs on a steep slope near the Point Sur State Historic Park and Lighthouse. The Arboretum’s Brett Hall coordinated the conservation project. Your practices in your own garden also could help to save the planet. A good start would be to attend Peter Raven’s talk..
Registrations for the Peter Raven talk sold out quickly. To receive timely announcements of future events at the Arboretum, visit arboretum.ucsc.edu/get-involved/. If you would like to sponsor an educational event at the UC Santa Cruz Arboretum, contact Jennifer Macotto, 831-427-2998 or jmacotto@ucsc.edu. For information on how you could help save a rare species: visit arboretum.ucsc.edu/education/plant-sponsorship/. This entry was posted in Essays 2014, Fall Quarter and tagged Bees, Butterflies, California Native Plants, Cultivation, Drought, Fertilizers, IPM, low maintenance, public policy, Sustainability by tomkarwin. Bookmark the permalink.